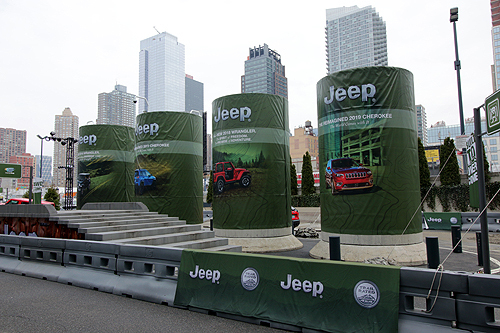 Every year the latest in automotive releases from auto manufacturers world wide converge on New York City at the Javits Convention center to show the press and public vehicles being released for the upcoming year. Many new cars are unveiled at the show so public days can be standing room only at times. Luckily we obtained a press pass and got into the show on press day to see some of the exciting new vehicles on display. Sure, there were plenty of new family toting options, cool cross-overs, some classics parked here and there, just lots of eye candy in many forms all over the show floor. But we concentrated our camera lenses on vehicles that lead to adventure, vehicles that follow the Axial philosophy. So after downing lots of free beverages from Nissan and Honda, candy from Acura and some mini breakfast sandwiches from Mercedes-Benz, we combed the show floors in search of some off-road machines and this is what we’ve come up with. 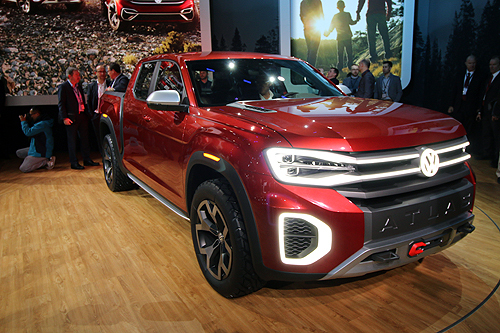 The ewn Volkwagen Atlas Tanoak Concept was on display and not an easy vehicle to get a photo of even on the less croweded press day. This truck looked great in person and the winch built into the bumper really caught our attention. 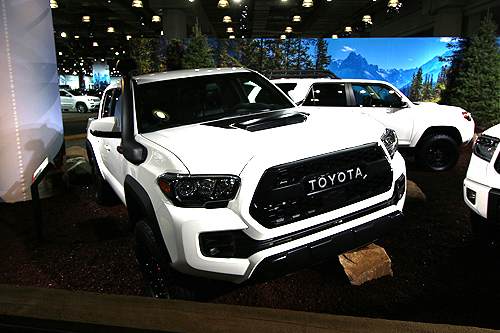 Toyota has several trucks and SUV’s on display some sporting optional TRD gear. 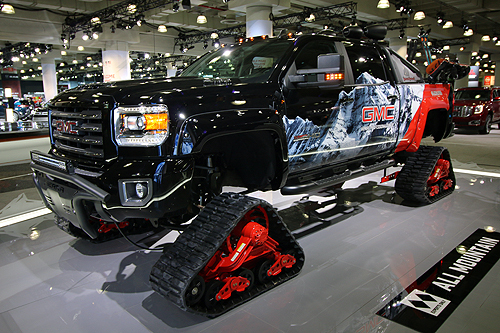 The GMC display showed off this Sierra beast with tracks on all four corners and enough LED lighting to turn dark into day. 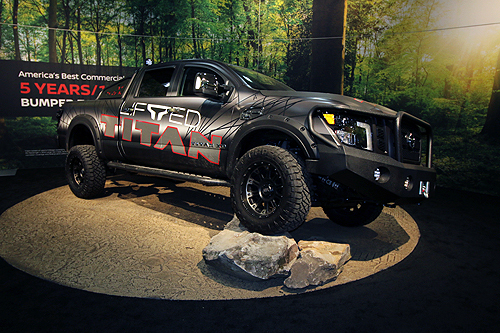 Nissan Titan anyone? Nissan needs more play in the off-road world and this truck fitted with an aftermarket bumper, sliders, roll bar and lifted suspension looked like it could handle it. 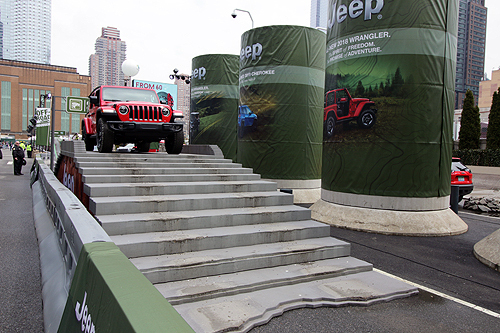 Jeep was on hand in full force with a complete booth indoors and their Jeep Camp outdoors. 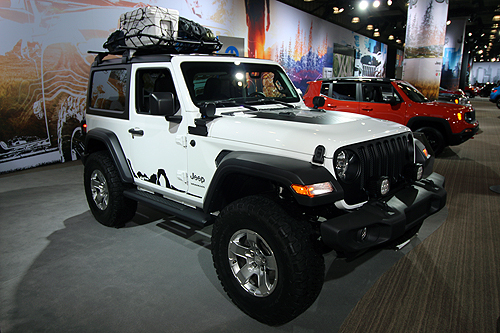 First we took a look at some Wranglers and Rubicons on display and some fitted with Mopar performance parts. But what stole our interest was Jeep Camp. 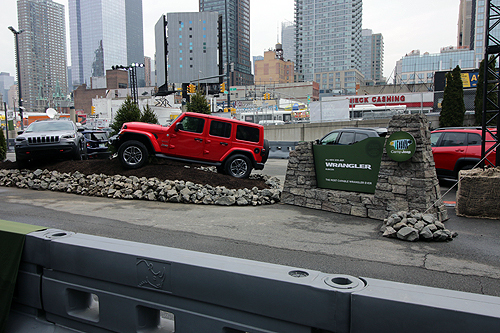 On press day, we shot right to the front of the line for a ride in a new JK Rubicon over the man made Jeep course nestled into the front of the Javits Converntion Hall in New York City. 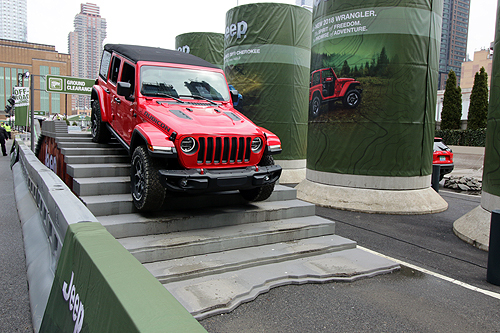 The tour over some obstacles like off-camber bumps, stair cases, and 30-degree incline lasted about two minutes with the driver laying down some eduction on the new Jeep. 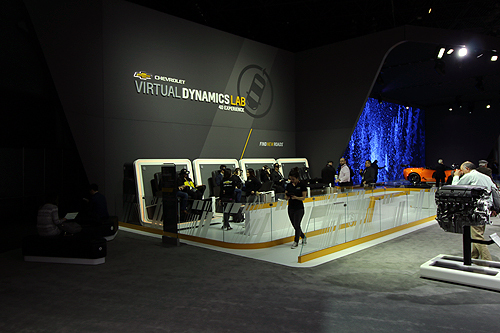 Many of the booths had VR experience centers and VW gave you a full game-style driving experience behind the wheel of a GTI. 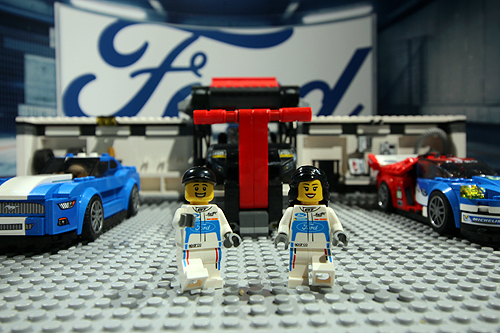 Finally Ford offered a Lego Ford Figure make and take along with a photo-op spot to show off your figure on social media. How could we pass it up? 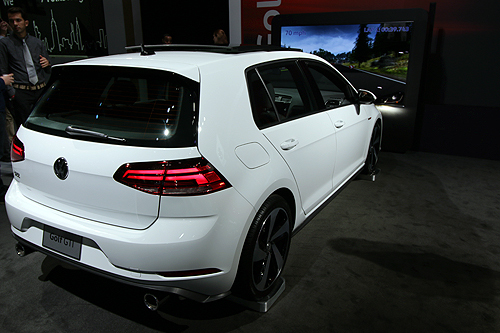 The NYIAS is always a great experience for the auto enthusiast. 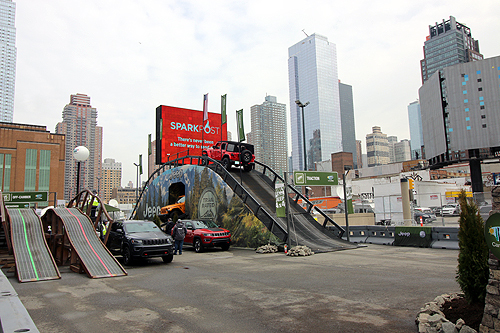 If you’re ever in the New York area at the end of March, hitting the International Auto Show is the perfect way to see all the latest releases in the automotive world. 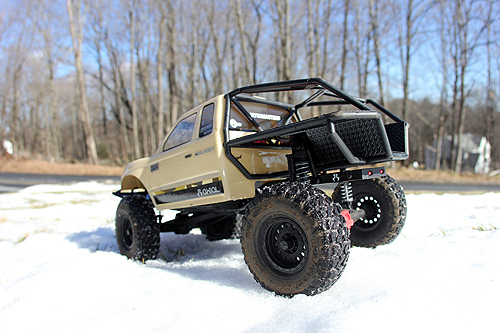 Axial is a company of enthusiasts for enthusiasts. 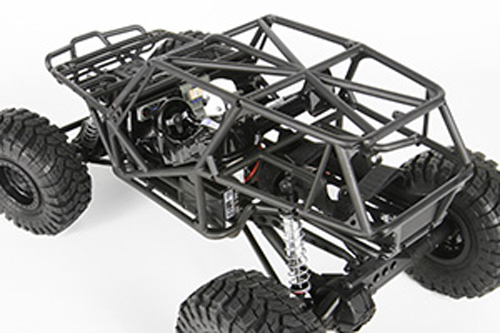 Axial develops extremely high end radio control models of vehicles that you are likely to see in the great outdoors. These models are designed to generate a tremendous amount of reliable fun that can be experienced by the whole family. 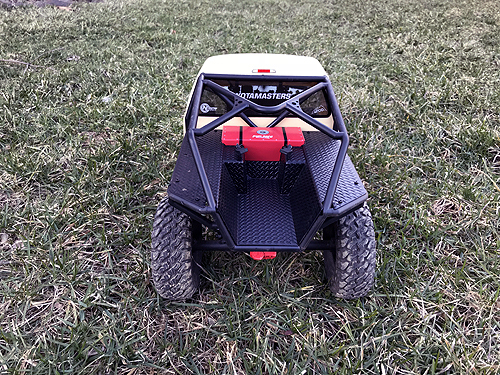 Whether you are a beginner looking for a new adventure or a seasoned hobby veteran, Axial offers a platform for you to personalize and enjoy in every environment. The Axial team encourages you to get outside and have some family fun! 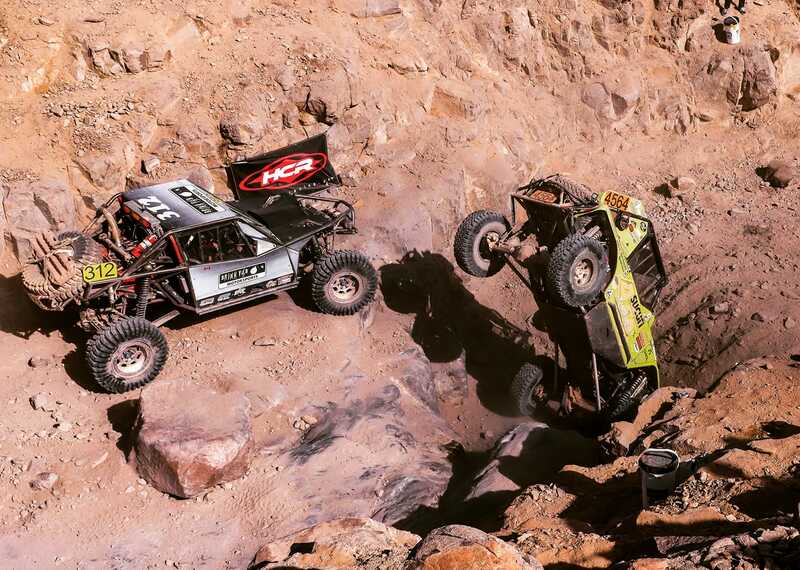 But wait… Which Axial vehicle should you get? 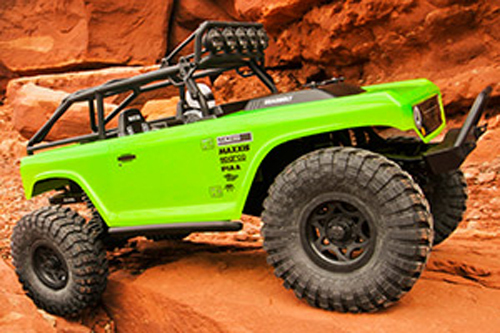 Axial offers a selection of orr-road adventure machines and each has their strengths for certain environments. Let’s go over each vehicle and their strengths to help you decide which Axial vehicle is right for you to start with. We have to warn you, it might not be easy to choose, but as your hobby grows there is another selection at Axial to meet your needs. 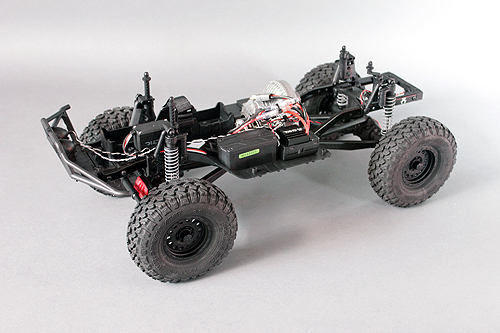 The SCX10™ platform is an already proven chassis-of-choice for scale enthusiasts around the globe. 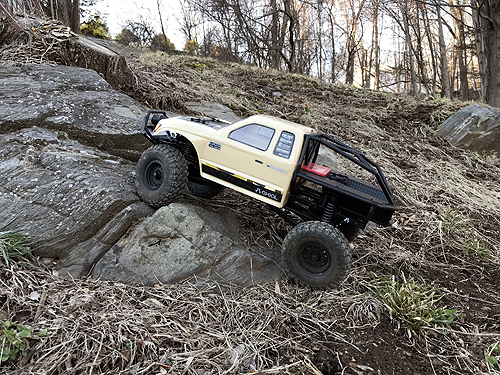 If you can hike there, your SCX10™ will drive there! With today’s efficient motor and long lasting batteries, you are only limited by your imagination and/or your physical readiness to adventure out onto a hike while driving your SCX10™. It’s a great way to get in touch with nature and spend time with friends and family while having a ton of fun doing so! 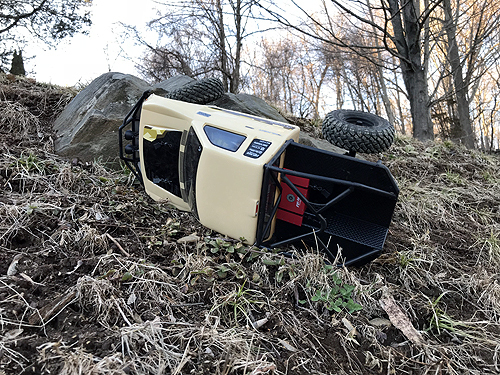 The SCX10 features a tough metal c-channel frame, proven axle design, low-CG transmission, ready to run electronics that has the power to tackle rough trail driving and backyard bashing. The SCX10 is topped off by a body that screams go for an adventure and licensed tires are ready to grip any surface. WHO IS IT FOR: Off-road trail adventurer looking for a vehicle that can reach speeds of a brisk walking pace. The SCX10™ II is the culmination of many years of development, furthering aesthetic realism while maximizing trail performance. The SCX10™ II features an all-metal twin c-channel frame rails, but that’s only 2% of the 98% of a completely new design. Scale AR44™ high pinion axles, a chassis mounted servo (CMS), re-designed transmission, front mounted battery tray, all aluminum suspension links, and a properly designed suspension for nearly zero bump steer. These are just a few of the features built into the all new SCX10™ II. WHO IS IT FOR: Like the SCX10, the SCX10 II is for the Off-road trail adventurer looking for a vehicle that can reach speeds of a brisk walking pace and tackle terrain that is a bit more aggressive. 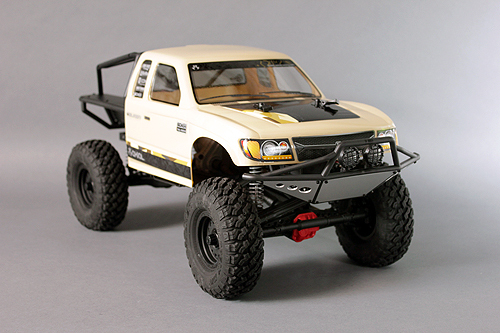 With the Yeti Jr.™ SCORE® Trophy Truck® – RTR, everything that existing Axial drivers have come to love and appreciate in the Yeti chassis, has been incorporated into a machine only now in 1/18th scale. It’s powered by a 380-sized brushed motor which provides the perfect amount of torque and speed for this tiny Trophy Truck® monster. 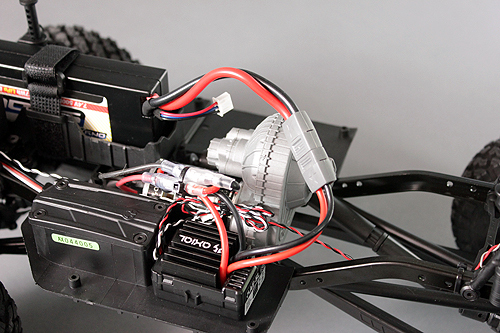 Also featuring an all-in-one programmable Tactic ESC and receiver, paired with a 3-wire micro high torque steering servo. 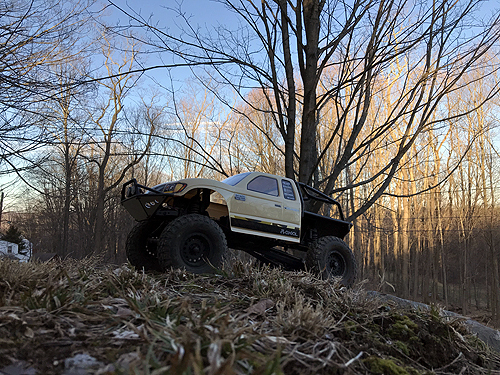 At the end of the day, the goal was to build a simple, fun, and easy to drive Yeti that anyone can handle. The hardest part about the Yeti Jr.™ SCORE® Trophy Truck® is making sure you have enough battery packs charged in order to keep the adventure alive! WHO IS IT FOR: For those working with smaller running spaces but still demand maximum terrain bashing performance. 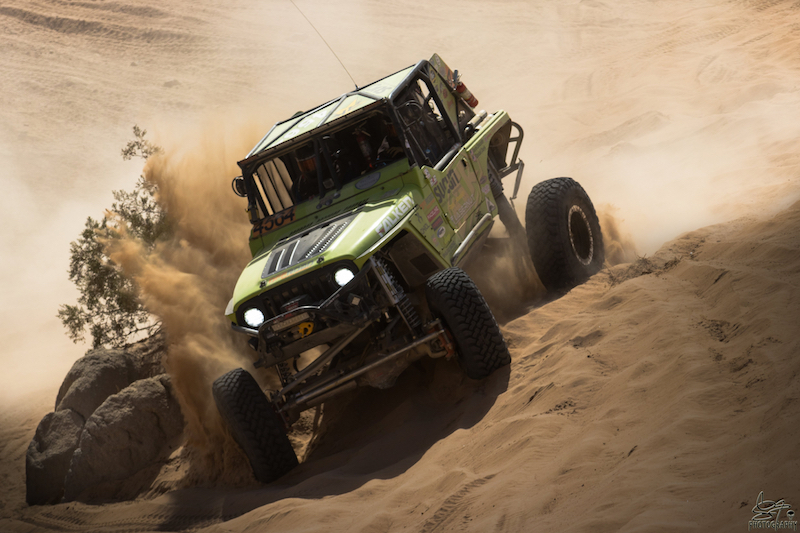 Available in kit or ready to run form, the Yeti™ SCORE® Trophy Truck® is a purposely engineered desert truck with a solid rear axle and independent front suspension. Make no bones about it, this is not a short course truck nor is it designed for the sugar coated and manicured racetracks of R/C. 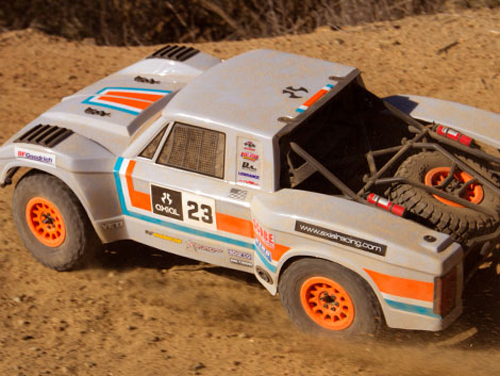 This Trophy Truck is designed for the roughest of conditions and REAL DIRT. 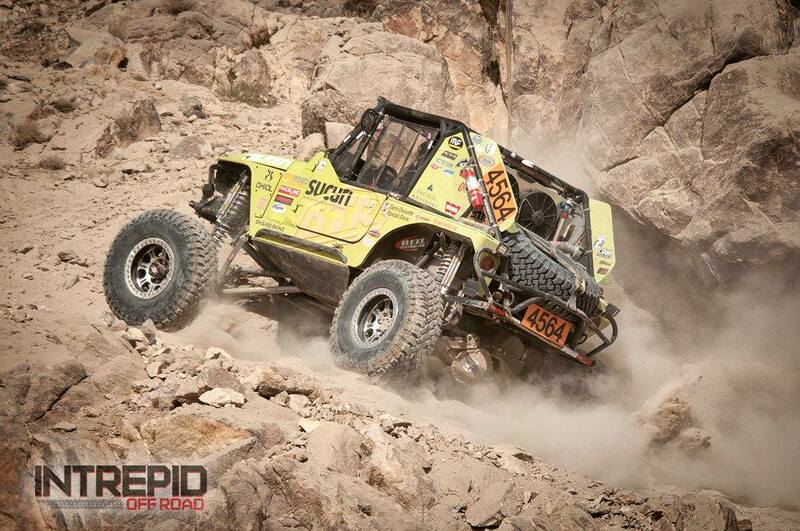 We beg for the dirt and rocks to be brought back to off-road! 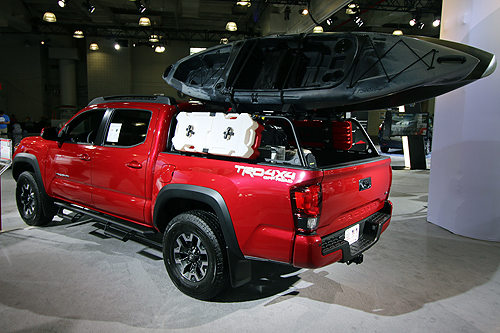 There are reasons why full size Trophy Trucks feature the four link suspension design; durability, capability, and improved forward bite without sacrificing suspension travel. Full-size Trophy Trucks inspired the distinct aesthetic and technical elements of this truck, right down to the solid rear axle. The retro inspired body features design queues from a 1960’s era roof-line, classic 1970’s wheel arches and glass shapes from the 1980’s. Giving this kit an extra bit of modern contrast comes in the form of fluorescent orange Method 105 wheels. This kit version will accept standard 1/10th scale brushed and brushless 4-pole systems and most major stick pack batteries. Precision machined aluminum shocks are standard equipment and deliver smooth suspension movement for consistent handling. WHO IS IT FOR: The Yeti is exactly what it sounds like, a beast on the terrain. 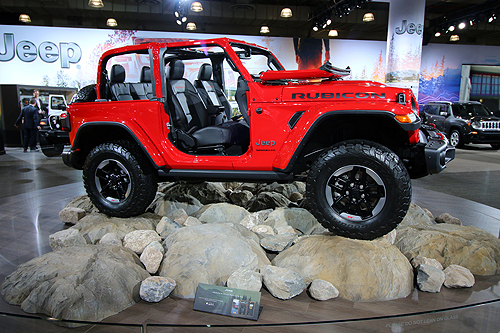 This off-road performer is fast and can handle anything from loose dirt to rugged rocky surfaces. 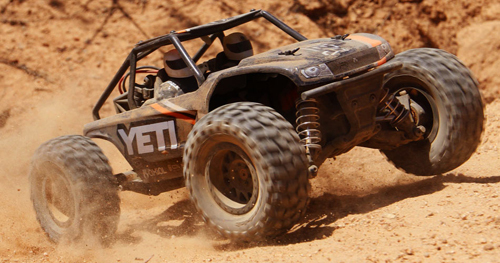 The Axial Yeti XL™ Monster Buggy – a new category, a new frontier, a new dimension. 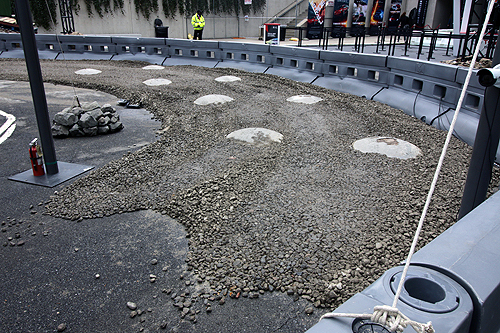 From the beginning of the concept through the design phase, we drew upon our brand philosophy to develop and deliver something different to the R/C monster truck arena. 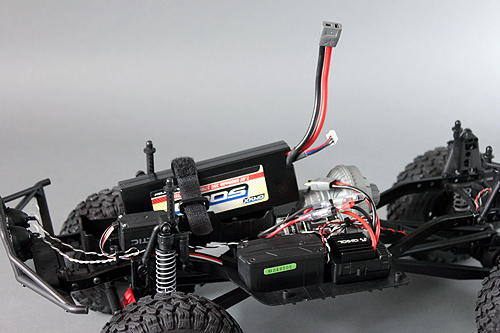 Monster trucks are known for bashability, so we jumped head first into the segment by creating a vehicle with insane brushless power along with features that would allow it to withstand the abuse that comes with the territory. From the outset, the goal of maintaining brand heritage was a priority. 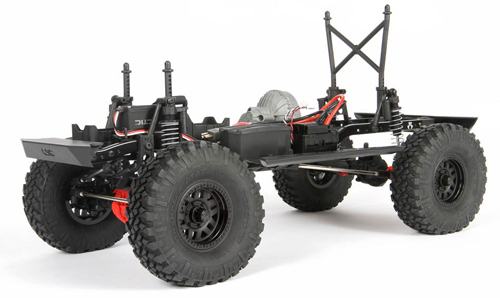 Our research and development team took those traits and attributes, mixed them with the Axial design ethos which is heavily rooted in full size rock racing, and developed what could be considered the next level in R/C monster truck design. WHO IS IT FOR: Size matters and if you need to go big, go bold and have loads of power on tap to obliterate the terrain than the Yeti XL is the perfect fit for your aggressive driving nature. 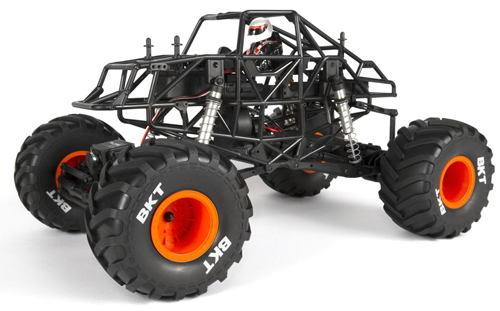 The RR10 Bomber is a build-it-yourself kit and is offered in ready to run form too and is considered the ultimate rock racer! The kit version features hard anodized aluminum suspension links, hard anodized aluminum steering links, long travel rear sway bar, hardened steel universal axles allowing up to 50 degrees of steering, aluminum lower link plates, and King adjustable machined aluminum shocks, all riding on sticky BFGoodrich® Baja T/A® KR2 tires wrapped around 2.2 Walker Evans Racing beadlock wheels. We’ve also included heavy duty bevel gears in the front and rear axles for improved gear mesh, and increased strength. 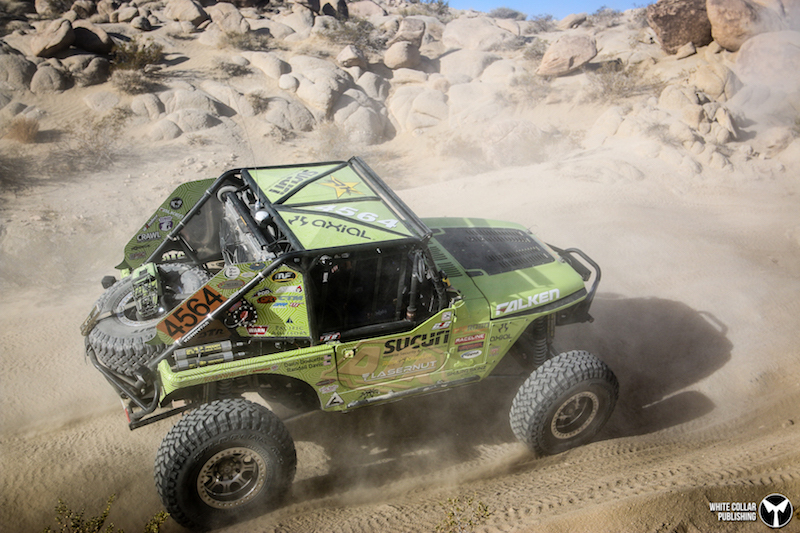 WHO IS IT FOR: Want to get the experience of driving like the rigs you see at the King Of Hammers, but without the price tag of the full scale machine or the build hours. The RR10 can deliver the excitement of raw power and rock thrashing, just on a smaller scale. 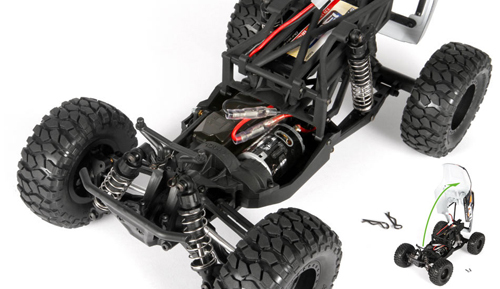 The Wraith™ Ready-to-Run 1/10th Scale Electric 4WD Rock Racer is another “FIRST” for Axial with the first and most realistic full tube-frame chassis design that is manufactured with high strength composite materials. 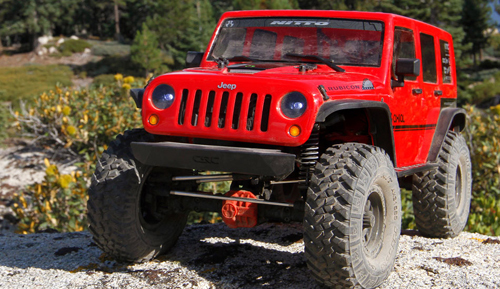 The Wraith™ IS BUILT TO GO FAST and is not just a low speed rock crawler. Each style of Wraith is packed with performance features and option parts that you add as you build it. The virtually bulletproof AR60 OCP axles are ready to take the Spawn through its paces whether blasting through the wide open desert or hammering its way through the toughest rock trails. The 2.2 Maxxis Trepador tires are a proven true grip standard, wrapped around industry proven Method IFD™ beadlock wheels. 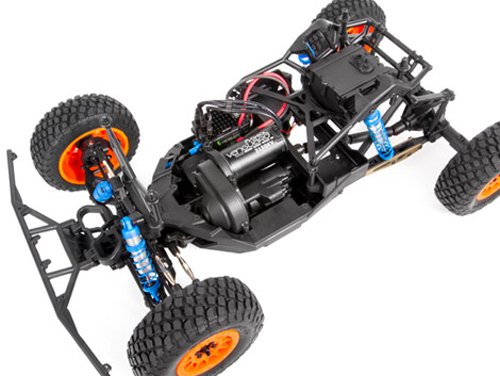 Whether you are rock racing or backyard bashing, the Wraith™ Spawn is ready for action. 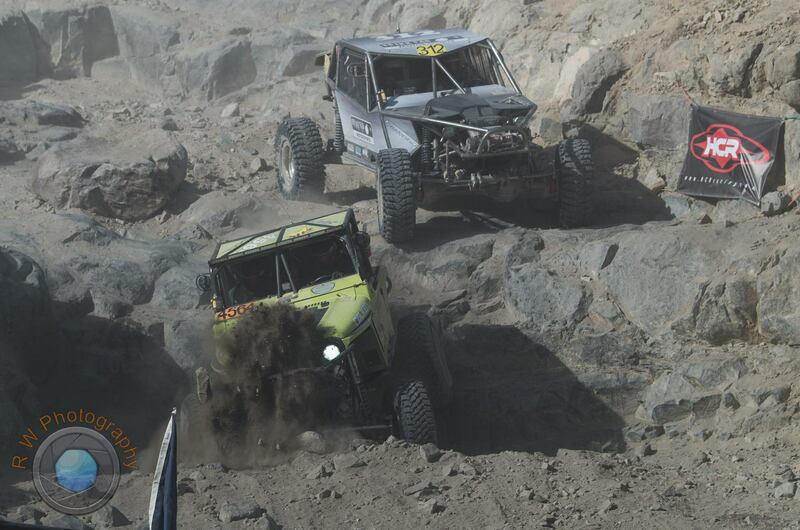 WHO IS IT FOR: Looking for the best of many off-road worlds? The Wraith is a proven rock racer that can also dominate the hiking trails with high speed performance and suspension that adapts to a variety of environments. Monster trucks are a never ending automotive attraction that captures anyone’s attention and the trucks featured in Monster Jam®. 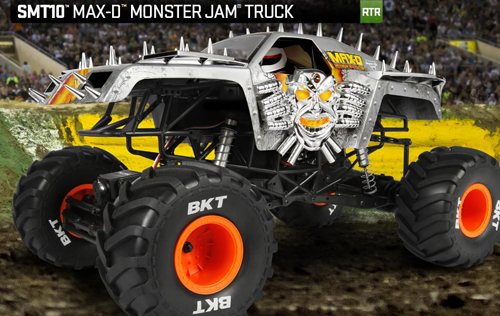 Axial went all out when designing the chassis and roll cage for the SMT10™ Monster Jam® Truck. Very similar to modern era full size monster trucks, this chassis was developed for maximum strength and an extremely detailed appearance. The truck also features tough AR60, long travel aluminum body shocks, licensed BKT tires and the styling to ensure you have a true mini Monster Jam experience. WHO IS IT FOR: If you’re determined to crush anything in your RC vehicles path from a row of cans, backyard flower beds or just go out for some general big wheel bashing, the SMT10 can handle anything you would expect from a Monster Jam style truck. Getting your RC adventure underway has never been easier with the well equipped, affordable SCX10 II Trail Honcho ready to run. 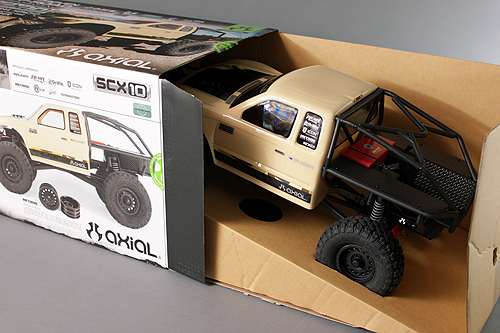 This revival of the original Honcho body, from the famed SCX10, now features an updated electronics package combined with improved SCX10 II platform. It’s aimed at getting anyone into the hobby and on the trails with success. It of course is also a great truck for the seasoned enthusiast. 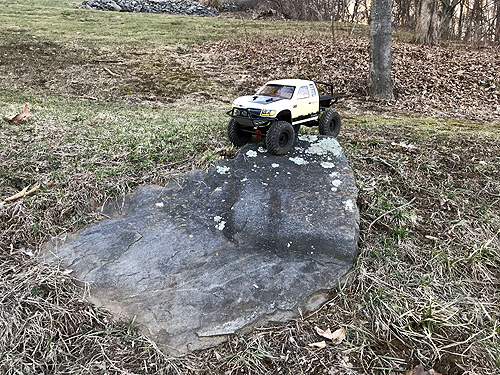 But our focus here is on the many who will pick up an RC transmitter for the first time with the Trail Honcho and we want their first adventure to be the best of many trail driving experiences to come. Here we’ll go over all the basics from the unboxing to checking over your rig for its first run, tips for your first drive and tricks to keep it in proper running order. Before just diving into your new RC adventure, take the time to unbox and educate yourself about everything that encompases your new Honcho kit. Inside the box, you’ll need to cut the zip-ties securing the truck to the inner box support. Remove the radio from it’s packaging and dip into the bag with instructions and accessories. The most important step here is to read the manual. Although we’re walking you through the paces here, it is always best to familiarize yourself with the manual in case you have any questions in the future. After your up to par with manual, take a look at what is included with the kit. 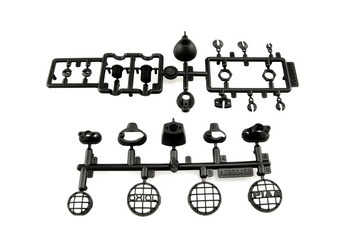 You’ll find a bag of “extra parts” these parts are unused during the assembly of the kit and may be used for future projects once you get hooked on your Axial adventures and trust us, you will get hooked. There will also be some basic tools in the kit, these should be transferred to your adventure backpack as they make great tools for on-trail repairs. And finally you’ll notice some green “domes” we’ll talk about this later. We’re moving onto the fun part; getting your Honcho going. First remove the four body clips that secure the body to the chassis, remove the body completely and set it aside. Now you can access the battery tray. At some point at your local hobby shop or online, you’ve purchased a battery and charger for the rig. Locate the battery tray and unhook the Velcro strap. Slide your charged battery into the tray and secure the velcro back in place to retain the battery. Next move to the transmitter and install four AA batteries that you supply into the radio. Power the radio on using the switch on the face of the radio. Now move back to the SCX10 II and plug in the battery. The battery plug is your on/off switch for the truck. Tip: The radio is always on first and off last. Your SCX10 II is now powered up and ready to go after placing the body back on the truck and securing it with the four clips. Head outdoors and place the Honcho on the ground for a quick systems check. The electronics should be dialed in from the factory, but things can happen. You’ll want to check to make sure your trims are set properly. First is your truck moving on its own when you power it up? If so, you will need to use the throttle trim on your radio to reset your neutral point. Use either button for throttle trim to find the neutral. If you tap the trim on one side and the truck starts moving more, it means you’ll need to use the opposite button to get the throttle back to neutral. Keep tapping the button until the car stops (is at its neutral point.) With the throttle set, check to see if the truck tracks straight. With the vehicle pointing away from you, give the truck a little throttle. Note if the truck tends to “drift” towards the left or right. If so, use your steering trim to find the neutral point of the steering in a similar fashion to the throttle adjustment. Wait! Now that your truck is trimmed, you probably have the urge to pin the throttle and see what the truck can do. We’ll get there. First start by driving slow in a figure eight pattern. This means giving the truck a little bit of throttle trigger input and steering the truck in a figure eight pattern; turn the wheel right, go straight a bit, turn the wheel to the left, repeat. This will help you get a feel for how the steering feels reversed when coming towards you. When the truck is going away from you, steering the radio wheel to the right will always turn the truck to the right, but will feel reversed coming back towards you. Get a feel for the throttle range in both forwards and reverse. Note: the throttle is not an on/off switch and is proportional. In trail truck driving much of your rock crawling adventures will happen at a slower speed. Before going out and driving on the gnarliest terrain you can find, practice on something less harsh. Find small hills or rocks with a slight incline to drive on. First drive straight up and down the obstacle. Note the amount of throttle it takes to make the incline and how the drag brake in the speed control affects the decline. Next drive up on an angle. Like a real vehicle, the trucks center of gravity may want to cause the truck to roll over. Determining the type of angle you can drive on before the truck wants to roll over is all a part of developing driving skill. 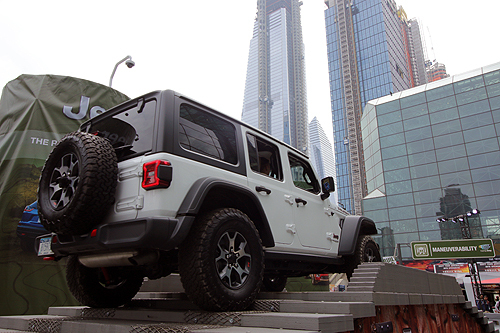 With a general feel of how the Honcho drives, you can venture out for tougher obstacles. 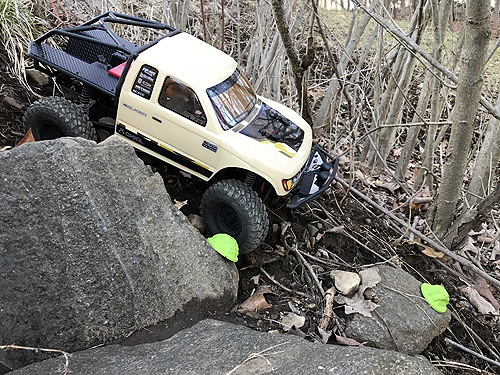 Find steeper inclines, off-set rock ledges, varying rock surfaces and use your newfound vehicle control to try and get your truck over the terrain. Think about where the wheels need to be places on rocks, how much steering you need to use, how much throttle and where will the truck be positioned when you’ve tackled what’s in front of you. Remember, you need to set yourself up for the next obstacle too. Then it will become time to refine your lines, challenge yourself and that’s where those little green domes come in that you found in the kit. These green things are gate markers and they are set on trail courses for your rig to pass through. They’re usually placed in positions that will challenge your skill. Find challenging parts on your trial and place these markers so you can practice driving through gates. What happens when your truck rolls over? Well, in real life, if a truck rolls over, no big hand reaches down from the sky to flip it back over. So, you need to use vehicle control to try and right the truck. If the Honcho is completely upside down, try using throttle and steering to “wiggle” the truck over. Or towards a nearby object. The point is to get the wheels to grab onto something to help pull it back over. If the truck is on its side, you can turn into the ground and give it throttle. This will oftentimes pull the truck out of the roll over and back onto its wheels. The rest of your driver education is up to you. To improve your skill, try locating nearby parks or even an urban adventure away from the public. Finding new places to have an adventure each time you go out with the Honcho will improve your driving skill. But in the bigger picture, you’re also going out and finding new adventures for yourself. Adventures that will not only build skills and love for a hobby, but will also build memories. Once your adventure outdoors is over, you’re not exactly done with your Honcho rig. A maintained rig is always a well performing rig. Take the time to remove any dirt and debris from the truck. A simple 2” paintbrush and a little elbow grease knocking off dirt from the truck can clean it up. Compressed air works as well. If your adventure lead you into the wetlands, take a look at our Driveline Maintenance Tips to help you with your clean-up procedures. At some point, You’ll want to join the custom club. Installing option parts to make your honcho stand out or to make it more durable for the adventures you’ll put the rig through. Here are five option parts we recommend you take a look at when taking your SCX10 II Honcho to the next level. 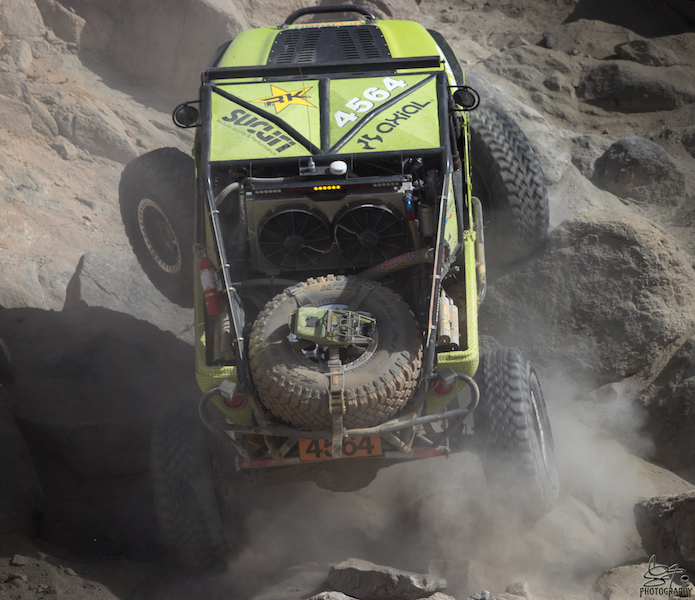 If you read the story of the Honcho taking on the Redonda Ridge Adventure, you saw the rough terrain eventually took its toll on the transmission gears. Luckily this is an inexpensive upgrade up to steel gears if you feel your truck needs it. The steering is among one of the most abused parts of any vehicle. Swapping the stock plastic servo horn for the aluminum option could prevent any unwanted steering issues on the trail. For obvious reasons the wheels endure a lot of abuse during use. This on occasion can lead to a wheel nut backing off. The locking serrated nuts grab onto the wheels for extra security. Although the links on the SCX10 II Honcho have been greatly improved over the previous units on the SCX10, upgrading to aluminum links is a popular upgrade for many adventurers. Like the suspension links, the stock plastic steering link can take a lot of abuse and flex during use. 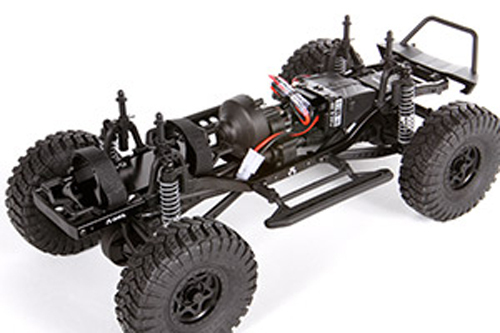 In this set, you can use the long link to upgrade your SCX10 II. With your new found hobby and new found key to adventure, keep things interesting by continuing to drive on new trails, build new courses in your backyard, continually modify and upgrade your Honcho to reflect you, your likes and interests. Every day is a new adventure behind the wheel of the Honcho and can give you new found enjoyment outdoors while learning new sets of skill. When you do conquer a new challenge, be certain to document your experience with a photo on social media and give it the hashtag #AxialAdventures so other adventurers can see what you’re up to. Lighting in a scale truck is pretty much mandatory nowadays. 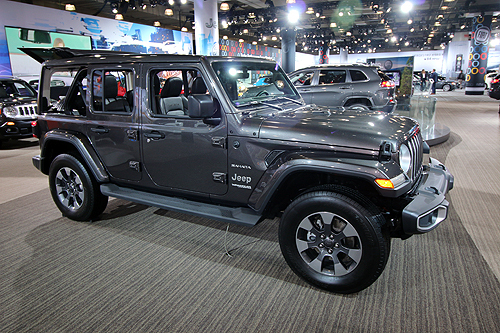 The new Jeep Rubicon Unlimited CRC and Honcho both feature factory equipped lights and the new AE5-L speed control to power the lights. However, if you don’t have one of those specific models, there are still plenty of optional LED lights available from the Axial line-up to customize your specific trail rig. Like many LED light sets on the market, each set has their own designated use and may need specific power setups in order for them to work properly. In this Axial LED overview, we’re going to take a look at the individual light sets and appropriate power sources and controllers so you know what is compatible when going to equip your rig with lights. The NVS kit gives you everything you need to give your rig a full custom lit look. Headlights, tail lights, marker lights and most importantly a power and control module. This system comes with the power module that will provide the correct power for the included LED light strings. Power to the module is provided by an in-line adapter that goes between the battery and ESC. This Simple LED Controller includes 4 bright white LED’s, AX24258, and 2 bright red LED’s, AX24253. Other light strands compatible with the controller are: AX24252, AX24253, AX24254, AX24255, AX24256, and AX24258. Controller can power two 2 or 4 LED Strings only. 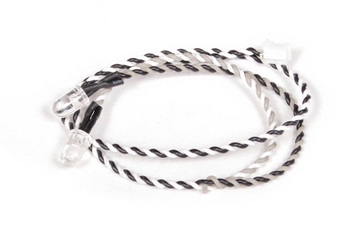 This light string works pefectly with the AX31152 Axial LED light bar or other custom applications. 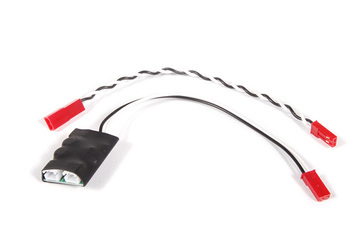 This specific light string requires the AX31097 3 port high output LED controller to power it. The perfect LED set for headlights. 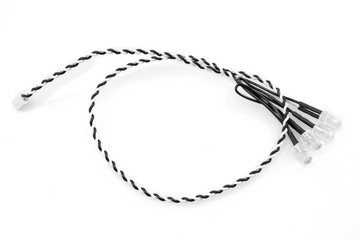 This light string can only be powered by the Axial NVS – Night Visions System – AX24251 and/or Simple LED Controller- AX24257. 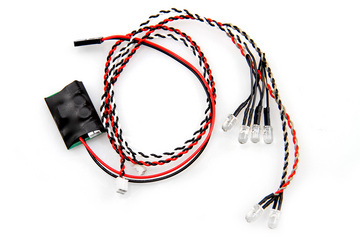 Often used for tail lights, the Double Red LED String must be used with Axial NVS – Night Visions System – AX24251 and/or Simple LED Controller- AX24257 installed for vehicles that do not include light strings. the Axial NVS – Night Visions System – AX24251 and/or the Simple LED Controller- AX24257. 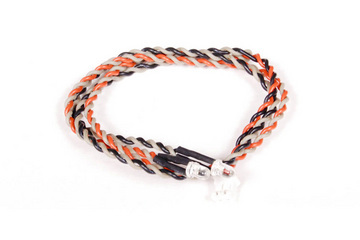 Additional/replacement LED light string. 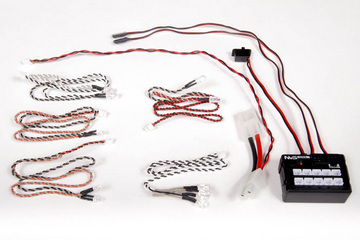 Must have Axial NVS – Night Visions System – AX24251 and/or Simple LED Controller- AX24257 installed for vehicles that do not include these light strings. 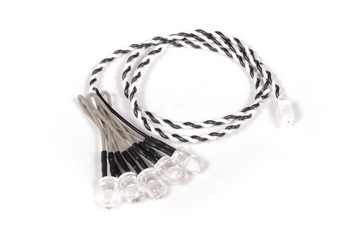 5 LED light string for auxiliary lights (White LED). Must have Axial NVS – Night Visions System – AX24251 and/or Simple LED Controller- AX24257 installed for vehicles that do not include these light strings. Must have Axial NVS – Night Visions System – AX24251 and/or Simple LED Controller- AX24257 installed for vehicles that do not include these light strings. Compatible with Axial’s 8 LED string (AX31098) in the HO port. A 2 or 4 LED string can run off of the two additonal ports. 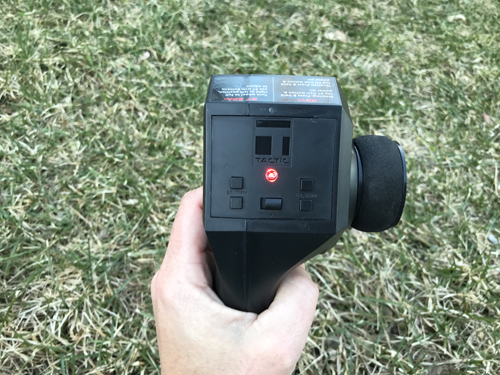 This light controller fills the gap between the basic simple LED kit (AX24257) and the full blown Night Vision System (AX24251). 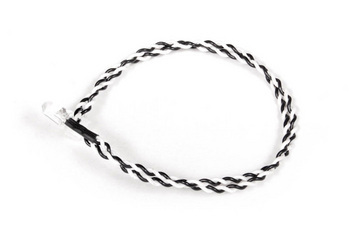 It has the ability to power 3 separate LED strings and Includes harness extension for removing the body. 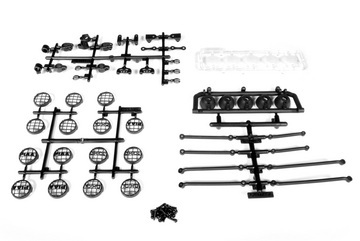 Axial’s new Universal 5 Bucket Light Bar Set comes with a complete set of screws and plastic parts designed for a variety of Axial vehicles as well as a universal system for additional mounting applications. The light bar’s tubular design gives your vehicle cool scale looks and each light bucket can be outfitted with an LED light to help guide the way on those late night runs (LED lights sold separately).The set also includes three different mesh grilles for your lights: plain, Axial and officially licensed PIAA grill covers. PIAA is a registered trademark of PIAA Corporation. 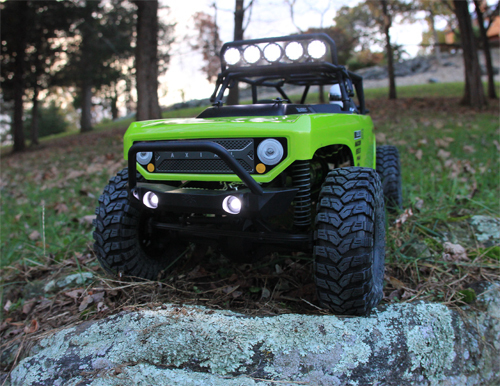 Axial LED light bar, officially licensed by Rigid Industries! 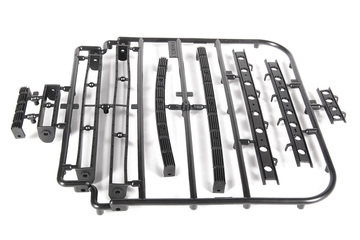 This molded plastic housing includes three different length light bars, hardware, universal mounting brackets, clear LED lenses and Instructions. 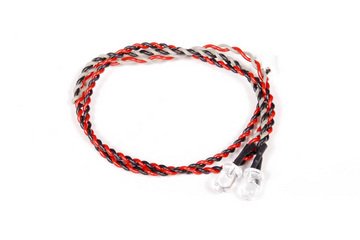 For use with optional AX31098 8 LED Light String (White LED) and AX31097 3 Port High Output LED Controller. Get custom and add lights where you want to. 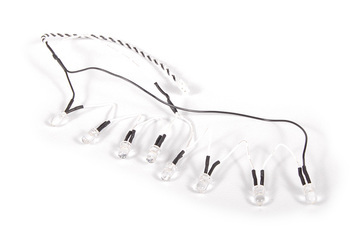 This set includes seven different styles of light buckets with plastic lenses in clear and yellow to hold 5mm and 3mm LED lights. Receiver Power- Units like the 3 Port High Output LED Controller can be powered from the receiver. A extension plug is provided to plug into any open port on the receiver. Be aware that the receivers voltage may be regualted and may not power the controller correctly. As a result the lights may appear dim. In this case you may need to direct wire the controller. Direct Power- The NVS includes an adapter to receive power directly from your rigs main battery. This ensures the unit receives the voltage necessary to light up the LED’s. Direct power connections is another way of hooking up other controllers or LED systems to power the LED’s. To do this, an extension wire needs to be soldered to the positive and negative battery wire solder posts, or wires, or connectors on the ESC. Now, when you plug in your battery, your LED lights will instantly illuminate unless you decide to solder in an in-line switch as well. Even with all of the information above, your personal alterations to your electronics may have an effect on your LED lighting. Other factors can include battery voltage. When making changes to your vehicle beyond what is described, be aware that additional testing may need to take place in order to make your system work properly.